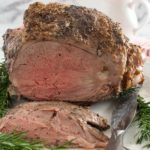 Why spend Easter in Prague? Prague puts on a spectacular show during the Easter Season, with street markets, local food stalls and street entertainment. We spent last Easter in Prague and it was a truly memorable trip. 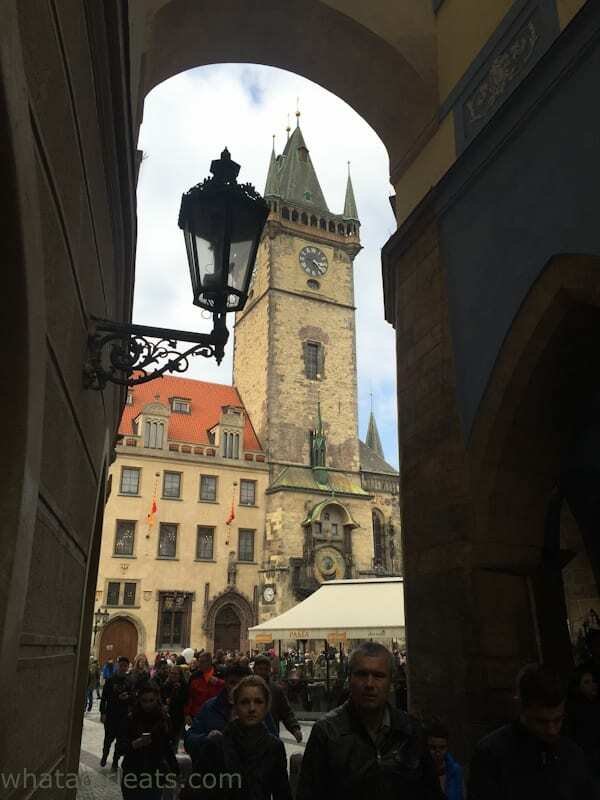 My oldest daughter, Emma, spent a semester abroad in the Czech Republic. She was intrigued after the previous year’s students came back to school raving about Prague. 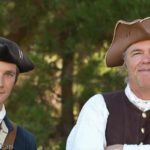 My husband Spencer, and younger daughter, Sophie, and I decided to visit her during our Spring Break, and take advantage of our “tour guide”. Fortunately Sophie and I have the same spring break every year, so we would only miss a couple of days on either end of the week. While Easter is typically bit chillier than late spring, there are also fewer tourists than late spring and summer. It’s also one of the most affordable cities in Europe. The Czech Republic uses the Koruna (crown) rather than the Euro, which at present is about 25 kourna to the dollar. 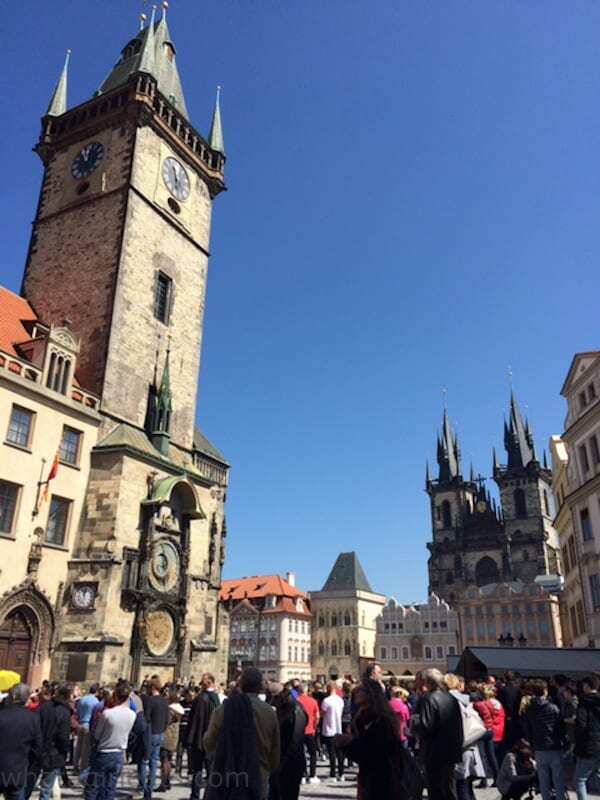 The Medieval Astronomical Clock Tower in Prague was installed in 1410, making it the oldest operating clock tower in the world. Prague Castle, canal on the Vltava River, Prague Castle from the Charles Bridge. and visit the Andy Warhol museum, John Lennon Wall, and the Dancing House the next. Andy Warhol Museum, the John Lennon Wall and The Dancing House. A stroll down the streets and alley ways in Old Town Square is like a visit to a fairy tale land. Each building is more beautiful than the next. Walking around Prague, one cannot help thinking that Walt Disney must have been inspired by this beautiful city when he created Fantasyland. Easter in Prague is particularly special. 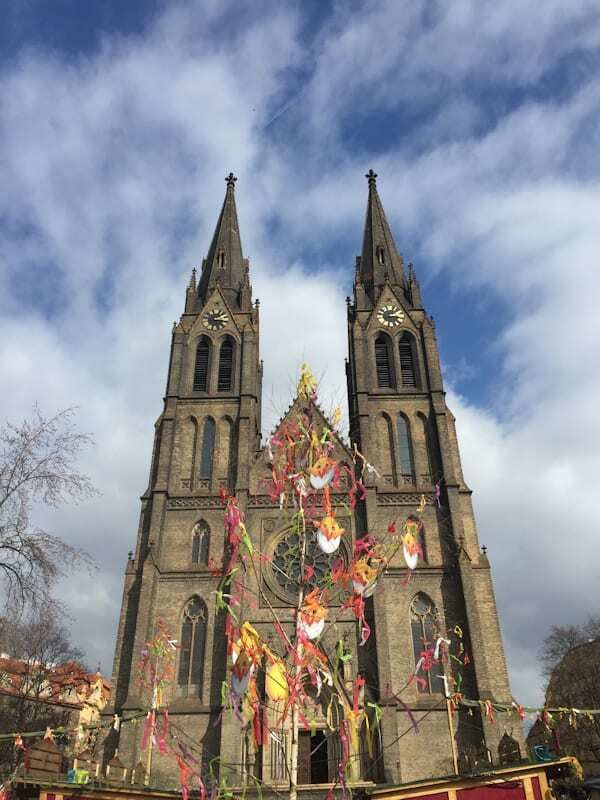 I was a bit struck by how important Easter season is to Czechs, especially since they really were not encouraged to practice their religion during the Communist regime. 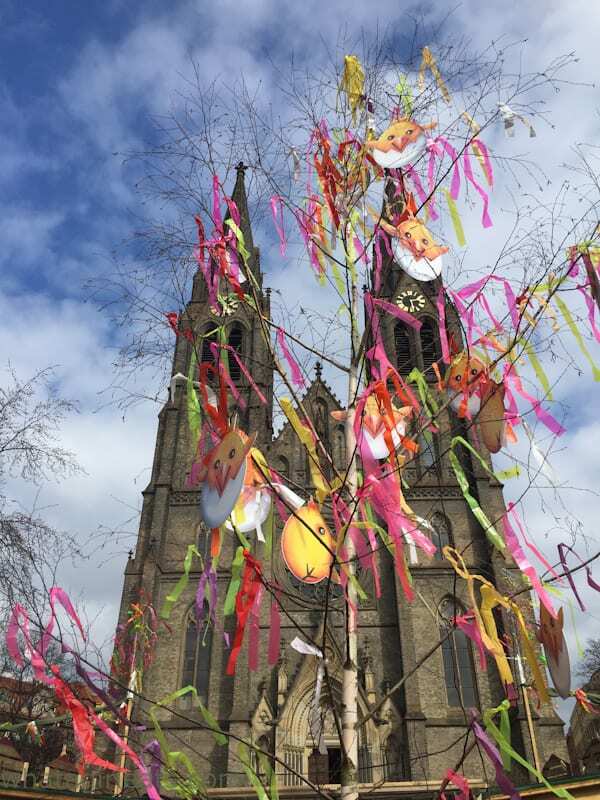 Unlike the United States, which is much more secular during Easter, the Czech Republic bedecks every tree, square and building with ribbons and eggs. Although the Czechs are not known for their cuisine, they excel at baked goods. Trdelnik stands, stalls and shops are everywhere in the city. 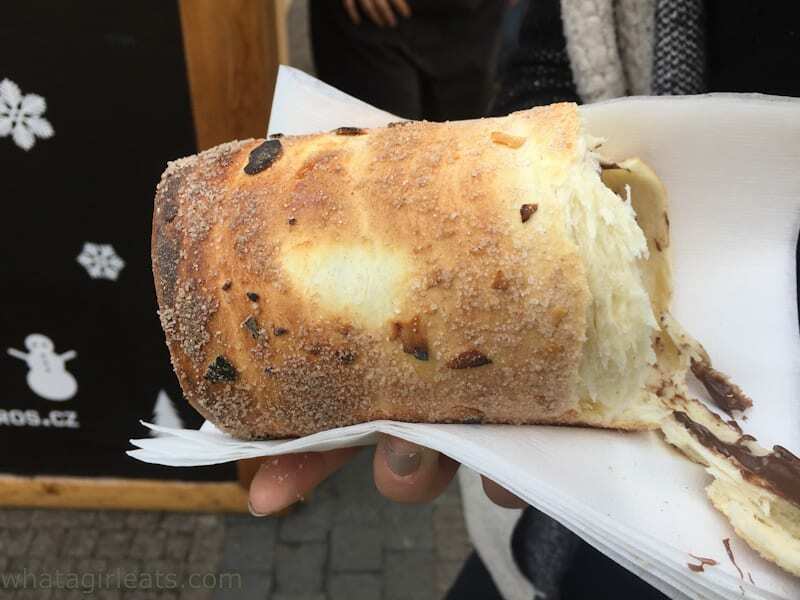 Trdelnik is a cross between at doughnut and bread. While it’s traditionally served with just cinnamon and sugar, Nutella is also a popular filling. It’s also a great vehicle for ice cream! Trdelnik hot of the grill. This one was filled with Nutella. 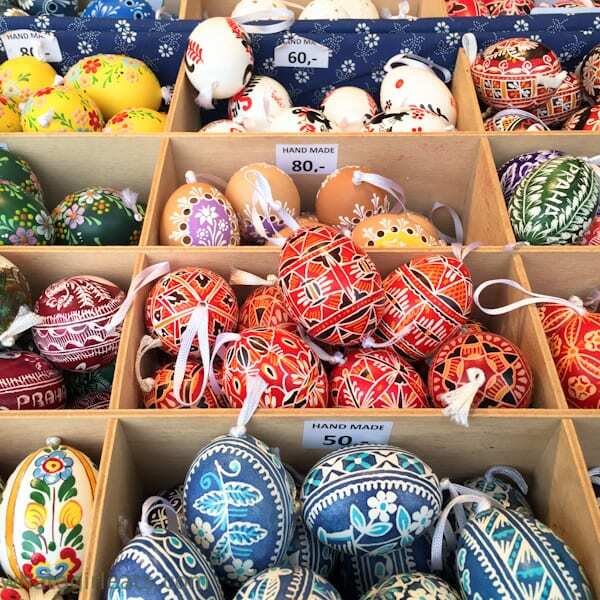 Similar to the beautiful Easter eggs that the Russians are known for, Czech artisans display their handiwork in stalls and markets all over Prague. Prague is a city that lends itself to walking. I sort of feel that way about most European cities, and always opt for walking over the metro. We walked between 8-12 miles every day while in Prague. Of course if you have young children, or are not physically up to walking great distances, there are busses, the metro and bikes to rent. For about $40 US dollars an hour, vintage cars with a driver can be hired for a city tour. 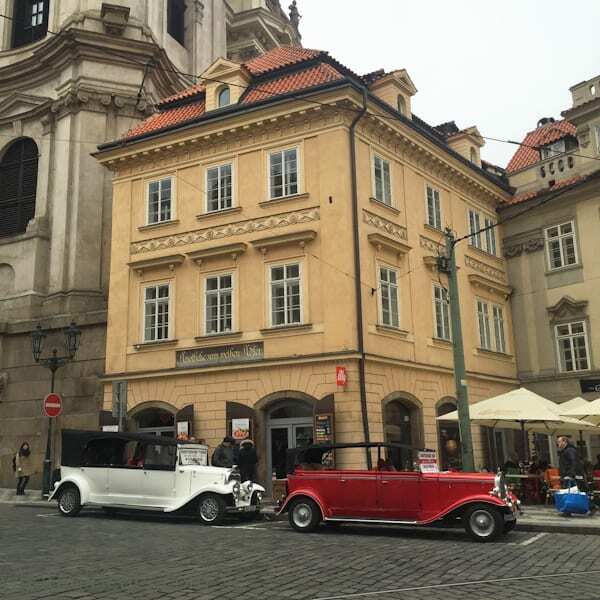 Hire a vintage car and driver for a romantic tour around Prague. Don’t forget to bring a bottle or two of champagne or wine! We had a few cool, rainy days, but when the sun came out, we were comfortable in light jackets. Even on the coolest of days, Czechs and tourists all over the city will dine out. In LA if the temperature dips below 70 degrees, everyone heads inside. In Prague, restaurants encourage outdoor dining, with heat lamps and sheepskin lined chairs, blankets and throws. 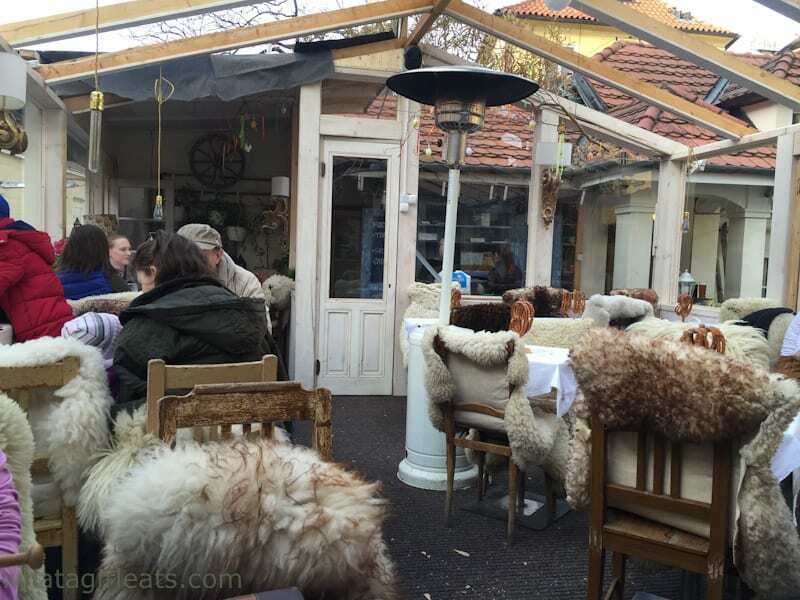 Dining outdoors is encouraged and is quite pleasant with sheepskin covering the chairs and heat lamps or fireplaces everywhere. We ate outside on all but the coolest day. While we were there, temperatures ranged from the high 50s (F) to the low 70s. 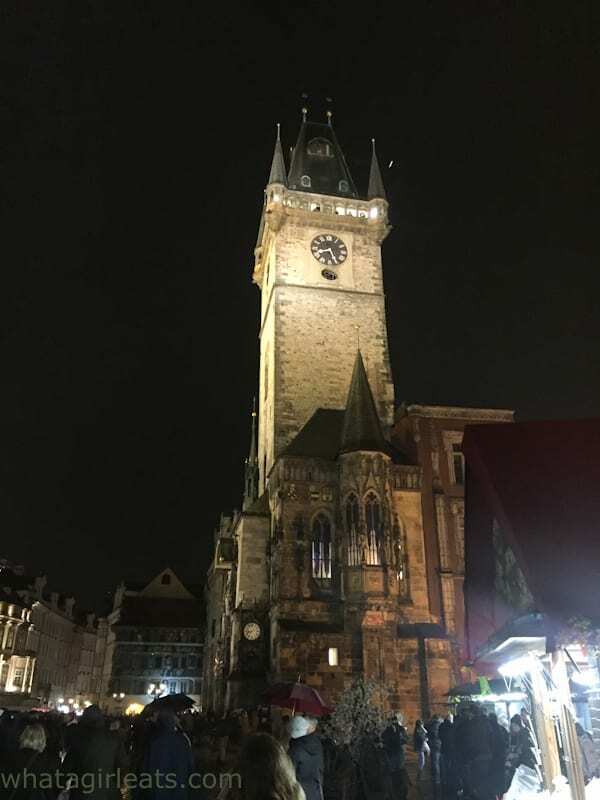 When it came to deciding on where to stay, we were conflicted between being close to Old Town, or across the Vltava in Lesser Town, which is closer to Prague Castle. In the end we decided on the ultra-modern Hotel Josef, located just off of Old Town Square. The rooms were clean and bright, with a sleek bathroom, free-wifi and a cool bar in the lobby. There is a gym and sauna available at no extra charge. The price for a double bed, (2 people) was under $150 US dollars. An ample breakfast is available at an extra cost. The ultra-modern Hotel Josef is clean and well situated just a few blocks from Old Town Square. There is so much more to say about Prague, I’m going to be doing a second post with a recipe, and more of the local dishes and delights of Prague. New Town Church on Easter Sunday. 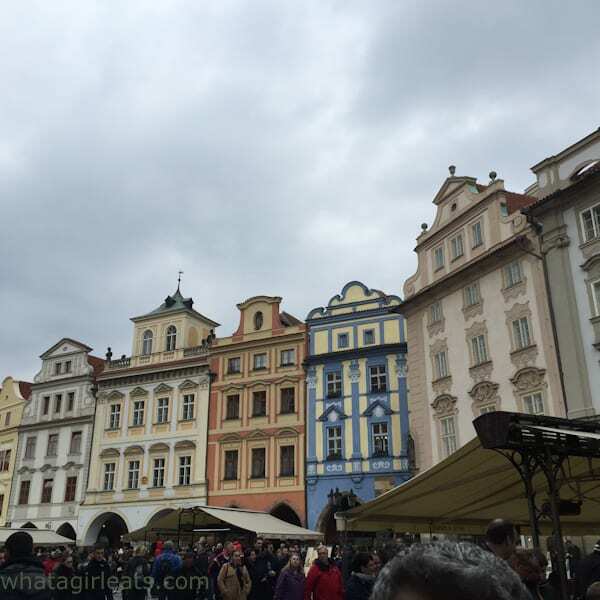 If you ever have a chance to spend Easter in Prague, I don’t think you will be disappointed! Easter in Prague, Czech Republic. What a perfect place to be for Easter! Great photos. And that bread!!! I love Prague. Never been during Easter but can imagine that it’s fantastic. I also loved the architecture as well. It’s one of my favorite cities in Europe now! The architecture is amazing! I love all these decorations! We were just in Vienna and Budapest and wanted to make it to Prague but didn’t have enough time on this trip. We visited Vienna and Salzburg after Prague, but I wish we had made it to Budapest. It was my daughter’s favorite city after Prague! I didn’t know they have Easter markets! I went to the Christmas markets in Vienna and Budapest this winter and loved them. I’d love to visit a Christmas market! I love to travel to Europe during the holidays. The markets are so wonderful and the seasonal foods are amazing. Prague looks like an excellent place to spend Easter. I agree! I have never been to a Christmas market in Europe, so I was pleased to find out that there was an Easter market in Prague! I agree Praha is a beautiful city! We stayed not too far from the amazing Dancing House, which I understand the Czech’s laugh about because the architecture just doesn’t fit the neighborhood. Our hotel served the most wonderful breakfast each morning which included poached eggs, bacon, and wonderful Czech pastries. We used the hop on and hop off tour bus which is a great way to see the city and popular attractions. Europeans love to dine outdoors no matter the weather. I’ve visited many German Christmas Markets and they are wonderful. 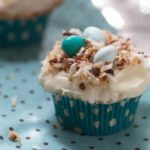 Now, I’m looking for those carrot cake cupcakes that I don’t believe I saw. 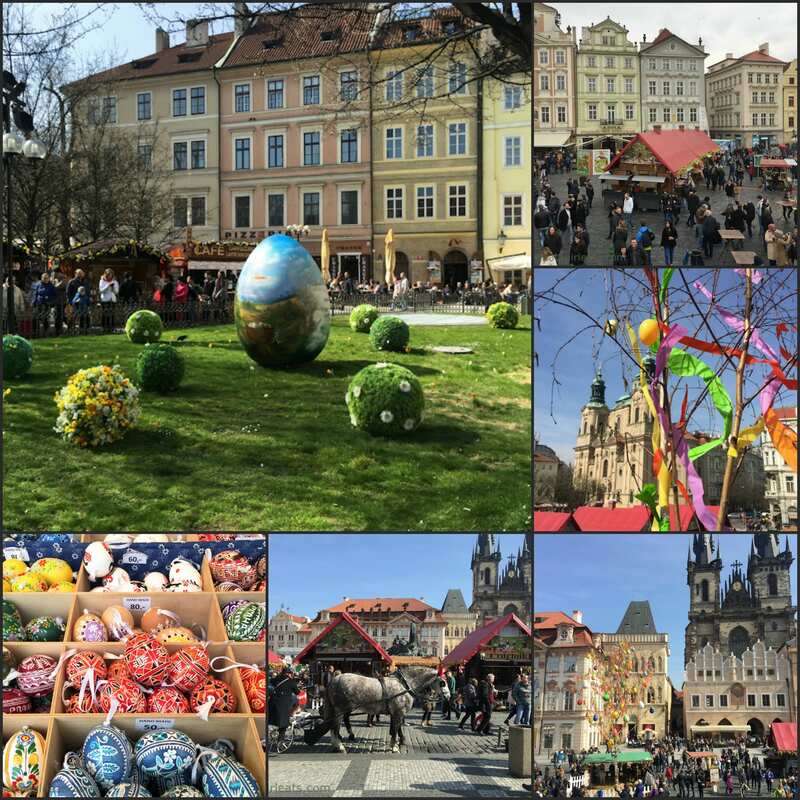 I was just in Prague last year and it was already magical, but Easter looks amazing! It’s so festive. I love all the colorful decor! I think it’s now my new favorite European city! First of all I would like to thank you for sharing such a great blog. This post will be really helpful to many people who are planning to travel the beautiful Prague. There are lot of beautiful sites one should visit during Prague tour. But I think you have missed out one popular most popular location that is Prague zoo. Prague zoo is a must visit site. I never had the chance to visit the Prague zoo…but I really need to make another visit and see all of the Czech Republic! I am very excited for my upcoming trip. I will be there in fall but will be sure to hit all of the sites you’ve mentioned. I am incredibly excited about the food. I think I might be more excited about the food in CZ than I was in Italy. But I am a huge pork and dumpling fan and it seems everything they make is with pork, dumplings or pork and dumplings! haha! well, I’ve got to say, it’s pretty hard to beat the food in Italy! Have a great time!